North Carolina « R-V There Yet? A note about having the right tools. A few weeks back we were driving to the Outer Banks in North Carolina. Prior to heading out onto the islands, we decided to fill up with fuel. We had only been on the road for about two hours. As a normal practice, we always check the tires prior to taking off for the day and when we stop. After filling up with fuel, I noticed a large bubble on the side of one of the tires. We located a rest area and we went to work changing the tire. Years ago, with our old trailer, our attempt to change a tire didn’t go well. I placed a jack under the axle and on top of a cinder block. The result was a crushed cinder block and a call to a wrecker for assistance. Shortly after that, I came across a slick item that would have helped considerably. This gadget, shown below, is really handy. 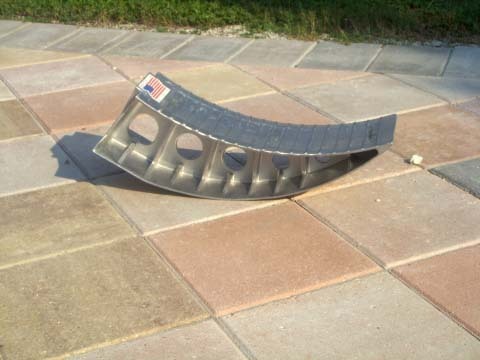 Basically, you drive the good wheel up on this little ramp and the weight is lifted off of the tire to be replaced. Slight use of a jack on the axle lifts the tire from the ground after the lugs have been replaced. Changing the tire was the right thing to do. 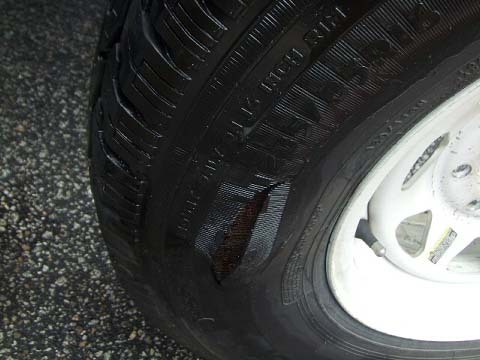 When we arrived in Charleston to have the tire replaced, the bubble had burst. 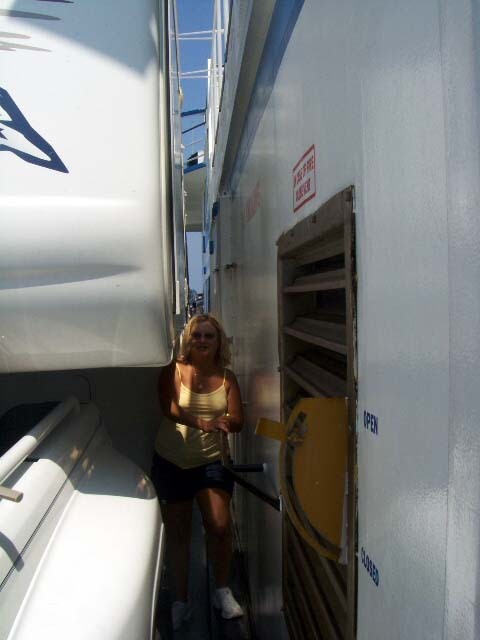 Had this happened while driving, we probably would have had a blow-out which would have been quite inconvenient and would have caused damage to the underside of the 5th wheel. The 5th wheel manufacturer recommends the use of a torque wrench at frequent intervals after a tire change and at the beginning of each trip to check the lug nuts. We’ve made a practice of doing this and, sure enough, after a change, I have had to tighten the lugs on several occasions. We loved the Outer Banks in North Carolina. They are the inter-coastal islands. 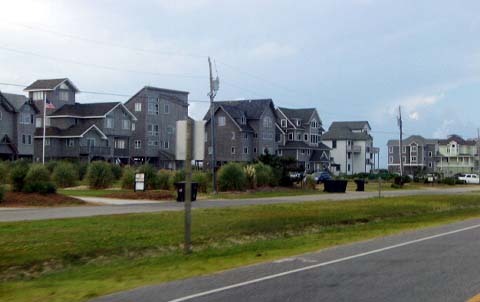 The towns were fairly small with great 3 or 4 story beach houses ( a level per family) to rent. There are only local restaurants to choose from and no national chains. We always hear about Cape Hatteras on the news if a hurricane is heading to North Carolina. 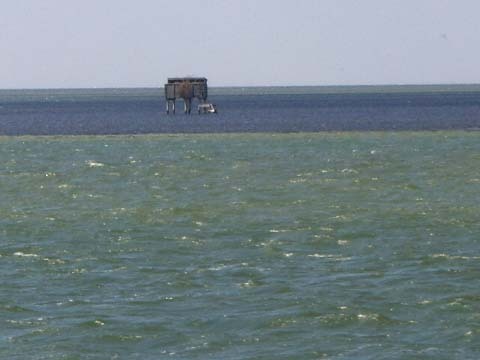 To get to the island we were RVing on we had to cross a high bridge to Roanoke Island. At the other end of the island we had to cross on a free ferry to get to Ocracoke Island which was about a 40 minute ride. We went to the beach on both islands. There were Duck Blinds out in Sound,. Does that look like fun, especially in the winter? 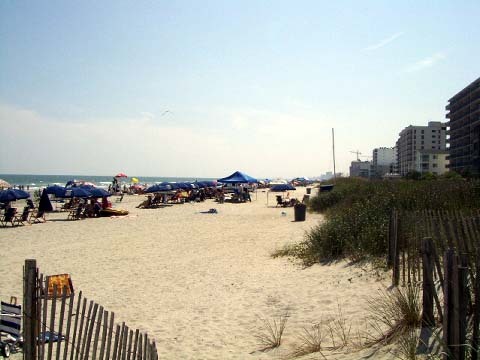 When we left the Outer Banks of North Carolina our next destination was Myrtle Beach, South Carolina. There were 2 routes we could take. 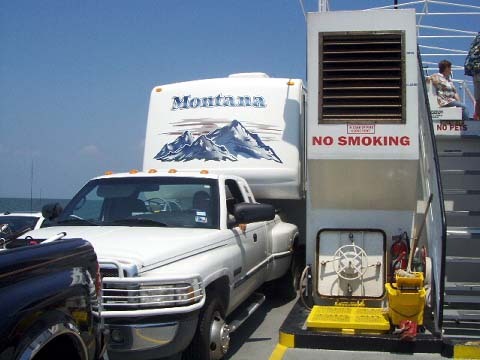 We could go back to the mainland and drive down the interstate or we could take 2 ferry rides and then get on the mainland of North Carolina later. We chose the ferry route. We rode the free ferry for 40 minutes and then drove to the end of Orcacoke Island and caught another ferry that took 2 ½ hours. It took about the same amount of time as driving but we were not spending our gas or wear and tear on the vehicles and ourselves. That was a fun and different way to travel to our next destination. 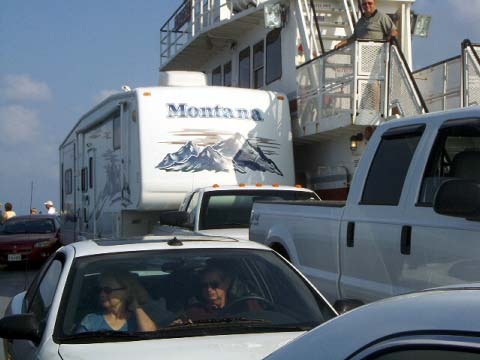 The scary part of that was they knew how to squeeze in as many cars as they could on the ferry. Just look how close we are to the wall. 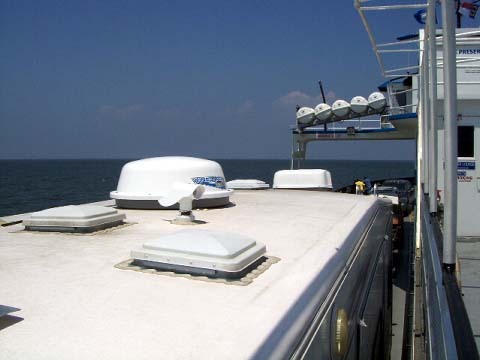 We climbed up to the top of the ferry and looked down on our rig to check our roof. Wish I had a bucket of water to climb across from the top of the ferry and scrub the roof rather than climbing up and down the ladder. We are now at Myrtle Beach, South Carolina which is fairly close to North Carolina. It is very different from the Outer Banks of North Carolina. There is a lot more people in this area and very commercialized for the tourists and more full time residents live in the area. It is a beautiful place with lots of housing communities built around golf courses. It is too populated for us. Much different than the Outer Banks where we just came from but we wonder how long it will take the Outer Banks to be just like Myrtle Beach. These hotels are right on the beach. Have you ever been on vacation to a location you are disappointed in and you have spent lots of money and time to get there? What do you do? You still go see all the sights and spend all your money on food and hotels. Having our house with us gives us flexibility. Since we really liked the Outer Banks and not real crazy about Myrtle Beach we saw what we wanted to see here and then just relaxed around our house. If we were on real vacation we would be not-stop tourists until time to leave not matter what. 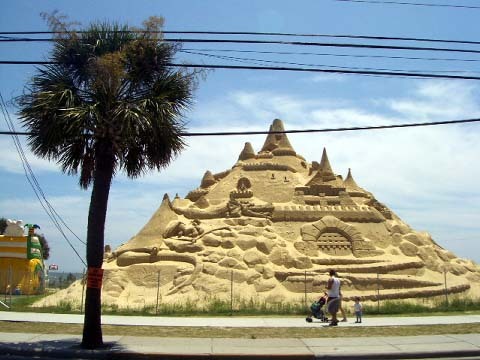 Big sand castle. Sorry to disappoint you but we didn’t create that. We hooked up in the drizzling rain near Houston and headed to Lafayette, LA. We drove off and on in the rain all day. 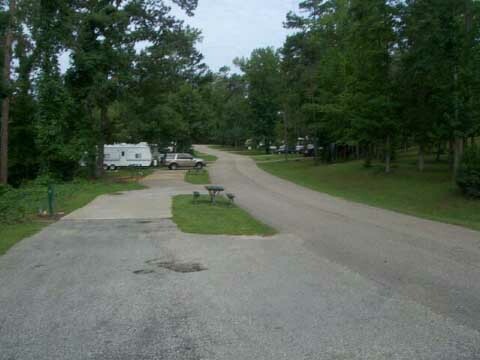 Our RV Park was out in the country and very pretty. Even though we have a washer/dryer combination we were behind on the wash. Four loads in their commercial machines and we are now caught up. See even traveling around the country we still have to do the same chores as we did in the stick and brick house. 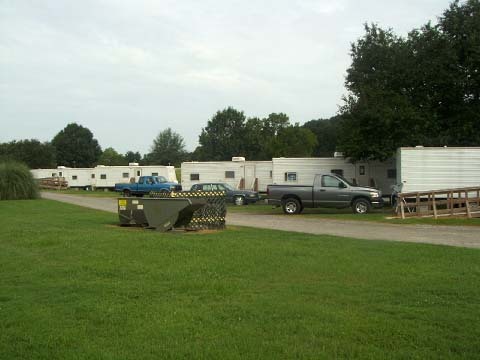 Here is a picture of the row of RVs in our row. Here is a row of RVs that look all alike. Doesnt quite look like our row of Montanas at the Montana Rally. This is a row of FEMA trailers. 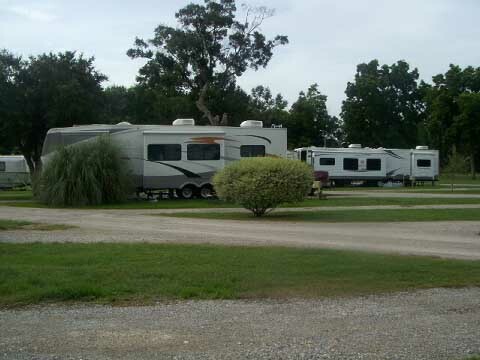 We saw a few RV parks with just all FEMA trailers. We ate at Ricks favorite restaurant in Lafayette, Prejeans (prey jzons), with Cajun entertainment. Rick had a baked lump crab in a cream sauce with cheddar cheese bubbling on top. Tinka had a combination platter of Crawfish etouffee and fried Crawfish. So much for the diet!!!!! We wanted to get up early and get on the road. Not to be. We wanted to make it to near Montgomery, AL for the day. It wasnt to be in the stars as it poured on us most of the day and we fell a few miles short. 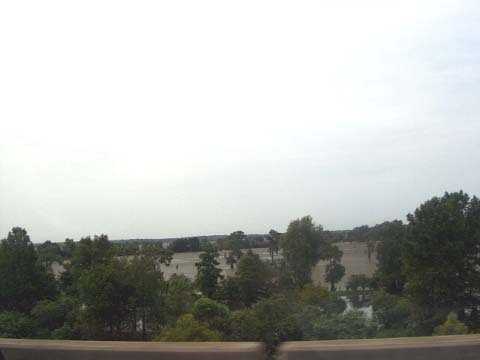 As we left Lafayette and headed to Baton Rouge, we drove over a bridge that is about 40 miles long. It was a bridge crossing the swamps, bayous and lakes. The bridge was about 30 feet high. 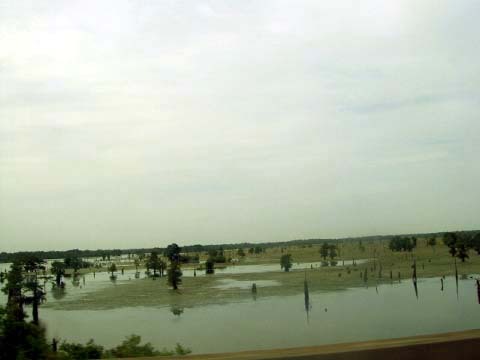 That must have been fun building with the mosquitoes, alligators and all the critters that live there. That is not land but green algae on the water. Another one of the swamp. We stayed in a city park near Montgomery, AL (that was 5 miles out in the country). 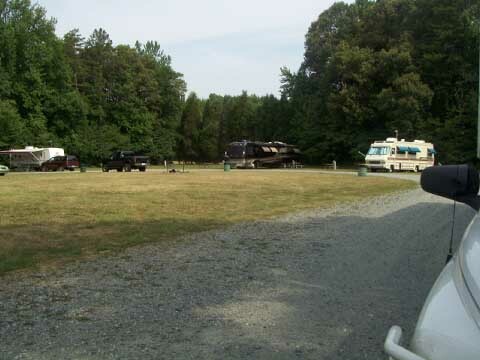 It was very different from all the RV parks we have stayed in everywhere. 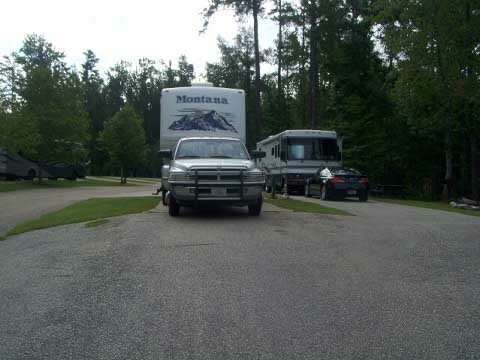 Instead of RVs parked all in a row, there were one or two sites by themselves scattered throughout the park. Most were pull-throughs running parallel with the roads. Easy in and easy out. We didn’t even unhook for the night. Our next drive was from Montgomery, AL and spending the night near Atlanta, GA. One of our favorite songs to dance to is Chattahoochee River by Alan Jackson. 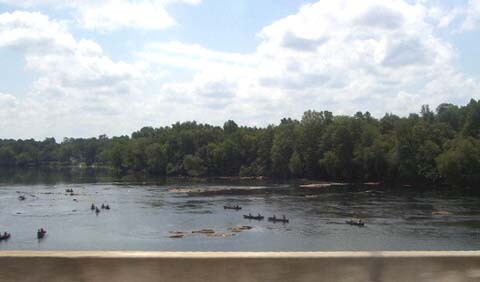 We passed over the Chattahoochee River 2 or 3 times on our drive into GA. It reminded us of the Guadalupe River near Austin that everyone tubes and floats down. There were people canoeing and tubing both times we crossed the river. We couldnt tell if Alan Jackson was in the crowd!!!!. Then we drove from GA to Greensboro, NC and stayed in another city park with lots of space. Last night we arrived in VA to meet up with Ricks 2 brothers and families. We are getting ready to go visit them now. We’ll put a hold on our traveling for a few weeks and do touristy things in the Washington DC area. To all the people in the DFW area have a dry day!